Mega Sale! 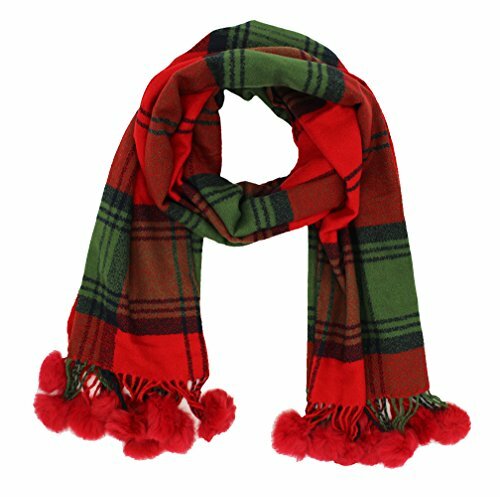 Save 26% on the Cashmere Feel Plaid Scarf Wraps Plush Balls Scarves For Women Lightweight by JAWEAVER at SCRHI. Hurry! Limited time offer. Offer valid only while supplies last. Specifications: *Material: Soft & Warm Cashmere like Acrylic. *Size: Approx 180*72cm; Ball Pendant: 10cm. *Color: Multiple Scarves for Choice. *Material: Soft & Warm Cashmere like Acrylic. *Size: Approx 180*72cm; Ball Pendant: 10cm. *Color: Multiple Scarves for Choice. *Gender: Women, men, girls, boys. *Pretty tartan with cute plush balls. Elevate your wardrobe with our winter updates. *2017/2018 New design plaid blanket scarfs for women, scarfs for girls. *Cashmere like and skin frindly, super soft, keep warm. A great neck warmer. *Great gift for family or friends, can slao be New Year scarves for women or kids. *Wonderful party favors for your guests if you want to host a theme party. *Outfox the cold weather with these need-now essentials. *Better to gentle wash with hands, then hang to dry. *Due to manual measurement, please allow a little size deviation. *Actual color may vary slightly from image because of different monitor setteings and shooting light. *Our company has focused on scarves for decades. *All products from JAWEAVER are brand new and in high quality. *If you have any problem, please take it easy to contact us at the first time. STYLISH: The checked scarf shawl wrap has a pretty NEW design with classic plaid pattern and cute plush ball pendants. You can take it easy to dress up with any of your cozy outfits on special occassions or in normal days. FUNCTION: Keeping warm of the neck is such an importable thing. No matter you are elderly people or office woker, housekeeper, students, kids, this fashion scarf is a great warmer and fine decoration for you. GIFTING: The multiple scarves will be great gifts for women or girls. The lady winter scarfs will be wonderful party favors for your guests, also will be lovely gifts for yourself, daughter, mother, lover, friends. MATERIAL & Size: The warm plaid blanket scarf is made of cashmere like acrylic. Size Approx 180*72cm, Ball Pendant:10cm. Soft Comfortable and Environmental Health. NOTES: Please allow a little size and color deviation due to different mesurement and light. If you have any questions about this product by JAWEAVER, contact us by completing and submitting the form below. If you are looking for a specif part number, please include it with your message.